Few states are growing more hemp than North Dakota. With more than 3,000 acres in active production and an unparalleled system for getting viable, certified seeds to interested growers, North Dakota could one day be the leader in hemp – just as it is for other agricultural commodities from corn to flaxseed. But North Dakota has natural enemies that limit hemp’s ability to thrive, as well as manmade issues that curb the plant’s potential uses. A 2017 drought plagued hemp growers in western North Dakota, with four farmers losing hundreds of acres each. The water woes could reduce interest in a crop for which production and seed costs are much higher than other row crops, according to state agriculture officials. By way of manmade obstacles, the state limits hemp production to seed and fiber, meaning the plant can’t be grown for high-value CBD oil. In addition, North Dakota has a dearth of processors: The sole processor presses the seeds into oil for food products. By contrast, the state doesn’t have any processors handling hemp fiber, the plant’s largest product by volume. That has prompted local hemp farmers to bale their stalks and store them away in hopes of a buyer in the future. Growers without spare storage are simply selling the seeds, then plowing the stalks under as mulch. North Dakota agriculture officials, meanwhile, say they’re not planning to seek legislative changes next year to change how hemp can be sold in the state. But North Dakota’s official state motto is “Strength From The Soil,” and hemp activists here hope that better weather and more processors will help North Dakota take the lead when the fiber market ramps up. Here’s what you need to know about North Dakota’s hemp market. North Dakota legalized hemp production in 1999, though the law didn’t lead to a hemp market because state authorities deferred to federal prohibitions on growing hemp. In response to the 2014 U.S. Farm Bill, North Dakota licensed its first private hemp growers in 2016, when just five farmers grew the crop under limited circumstances. The number of North Dakota hemp growers jumped to 35 in 2017. 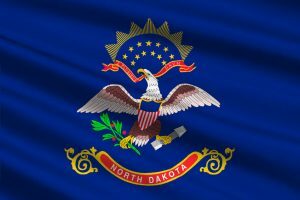 Unlike other hemp regulators, North Dakota’s Department of Agriculture has helped interested growers acquire certified seed from neighboring Canada. But weather wasn’t kind to the additional growers in 2017, with dry conditions in the western part of the state parching whole fields of hemp. The plants that survived saw lower yields. Applications are now open for 2018, with no acreage limits and no limits on how many farmers can grow hemp. 50 cents per pound for seeds to be eaten as food products or pressed for seed oil. No reliable price per pound for stalks to be turned into fiber, because no processors exist. No reliable price per pound for flowers, because CBD extraction is illegal. The market limitations are leading North Dakota’s few hemp growers to store most of what they’re growing and hope for change. “If we had a market for hemp, it’d be a tremendous cash crop,” said Tyler Kirkeide, who grew 130 acres of hemp in 2017 alongside wheat, barley and pinto beans. Kirkeide’s farm in Baker came through this year’s drought and saw a healthy hemp harvest – but Kirkeide was forced to roll the stalks into 205 bales because of a lack of buyers. That’s about 267,000 pounds of hemp stalks that Kirkeide is keeping in barns. “You can’t store the grain for a very long time, cause it’ll turn rancid. But I’m keeping the straw until we get a market established,” Kirkeide said. North Dakota’s hemp growers also face high per-acre licensing fees, totaling $150 a year plus $25 per acre to pay for state THC testing. Given that many hemp growers in North Dakota have more than 100 acres in hemp, that’s a sizable annual bill. In Colorado and Tennessee, by comparison, the per-acre fee is $5. Despite the limitations, Kirkeide says the seeds alone make hemp worth growing, and he’s planning to raise hemp again in 2018. He’s hoping that looser hemp rules on the state and federal levels will make his investment worthwhile. “I just want them to open up the market so we can get going,” Kirkeide said. Until state regulators or lawmakers change how hemp can be sold, North Dakota’s market for the plant is unlikely to grow past a niche crop for food-grade seed products. “It’s all going to depend on the processing,” said Goehring, meaning that North Dakota’s hemp future depends on getting processors for the plant’s fiber. He knew of no potential processors making plans to do so. Moreover, Goehring cautioned that high seed prices, relative to other crops, along with weather uncertainty and limited options for pest management, could keep many North Dakota farmers from experimenting with hemp. Like with NLD, WLD ( narrow leaf drug and wide leaf drug) cannabis. There are many strains of cannabis. There are also many varieties of hemp. One rare varietal has almost no THC or CBD. With larger flowers it’s seed production is higher. Being limited to the Canadian variety has handcuffed our industry before it has a fair chance to start. In the NLD and WLD markets. Multiple breeders produce the best strains. Our hemp market should have that same advantage. Corporate farming has never benefited farming families. Heavy State regulations hinder our farms and communities. Do you know if hemp grown in ND can yield oil that can be used to produce high quality CBD products?